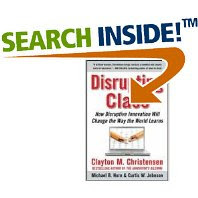 Disrupting Class: How Disruptive Innovation Will Change the Way the World Learns by Clayton M. Christensen, Curtis W. Johnson, and Michael B. Horn looks interesting. Disrupting Class is again a high class book. Christensen has applied his disruptive innovations theory to the US education sector en presents a crystal clear en compelling vision on what is going on in that sector. In a transparent way he also comes to a prediction of how education will change. Christensen foresees student centric education which is facilitated by online courses. Maybe I'll write more about this book which is a must read for policy makers, consultants and managers in the education sector. Here is a description from amazon: "It's no secret that people learn in different ways, so why, the authors of this book ask, "can't schools customize their teaching?" The current system, "designed for standardization," must by its nature ignore the individual needs of each student. The answer to this problem, the authors argue, is "disruptive innovation," a principle introduced (and initially applied to business) by Harvard Business School professor Christensen in The Innovator's Dilemma. The idea is that an audience in need will benefit from even a faulty opportunity to fulfill that need; in education, the demand for individual instruction could be met through infinitely customizable online computer-based instruction. The authors, all professionals in education, present a solution to the ills of standardized education that's visionary but far-fetched; even they admit that their recommendations would be extremely difficult to implement in current school systems. Still, the authors' unusual case, though occasionally bogged down in tangents, is worthy reading for school administrators, teachers, parents and, perhaps most of all, software developers."